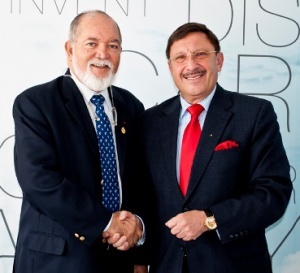 Seychelles’ founding President Sir James R. Mancham was welcomed on arrival at Sofia International Airport, Bulgaria, on Sunday 29th May 2016 by the Honourable Maxim Behar, Seychelles Consul General in Bulgaria. Sir James arrived from Belgrade, Serbia, where he had attended a high-level conference concerning the ‘Future of the Romas in Europe’ jointly hosted by the European Centre for Peace and Development (ECPD) and the Luxembourg Institute for European and International Studies (LIEIS). Following keynote addresses by Professor Dr. Federico Mayor, President of ECPD, who was for several years Director-General of UNESCO and Professor Dr. Christopher Coker, Professor of International Relations at the London School of Economics and Political Sciences, Sir James made his introductory remarks in his capacity as a longstanding member of the ECPD’s Academic Council. Sir James recalled stories from his youth where the Romas, who were commonly referred to as ‘Gypsies’ because of their nomadic lifestyle, conveyed a negative picture of these meandering people in Europe. “There was never a static cohesion of Romas under one leadership. In this connection, they have behaved like Stateless people or people belonging to a failed State and often their right to citizenship and respect for their human rights have been neglected or overlooked,” he stated. Sir James went on to explain how, following the creation of the European community, various initiatives have been taken by various European nations in an endeavour to solve the plight of the Romas and provide them with their human rights and dignity as a people. Before participating in the Belgrade encounter, Sir James was in Hamburg, Germany, discussing with the Executive Board of the World Future Council (WFC), and subsequently in Berlin, Germany, discussing with the Institute for Cultural Diplomacy (ICD) on various general peace-related issues and the problems of the Romas in particular. Sir James who was awarded the Africa Peace Award 2016 on the 12th April in Nairobi, Kenya, returned to Seychelles on Sunday 5th June.